I love to hold my babies. I snuggle with them, rock them, and sing to them. It’s a bonding time for us, and I cherish it. But I’m a mom of 3 boys. I am BUSY and I can’t always cradle and snuggle my littlest one the way I wish I could because I have two other boys who need my care and attention as well as a house to keep up with. And so I need a place to lay baby down where he is happy and comfortable as if he were in mama’s arms. 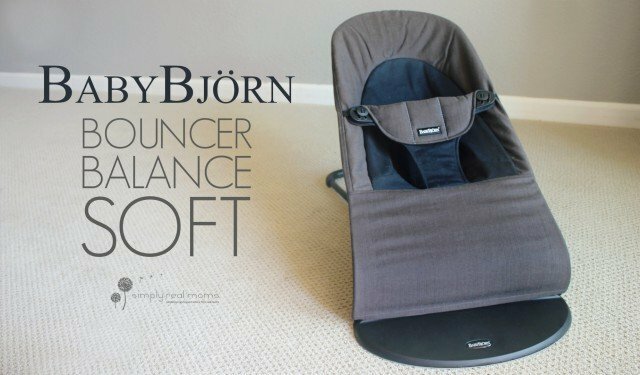 Thank goodness for the Baby Bjorn Bouncer Balance Soft! This bouncer chair is Charlie’s new favorite thing and it offers me a wonderful break for me to be able to help my other two boys or get some work done around the house! This simple chair has been used by moms all over since it was first introduced over 50 years ago-that’s right 50 years! A product that stands the test of that kind of time is a keeper. 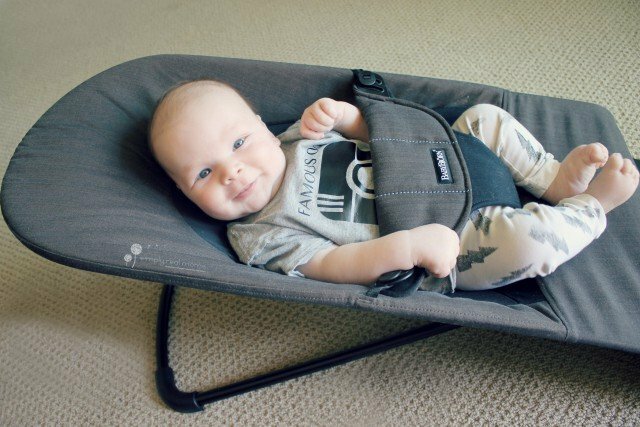 The Bouncer Balance Soft props baby up in a slight recline and is designed to allow baby’s movements to bounce the chair naturally! 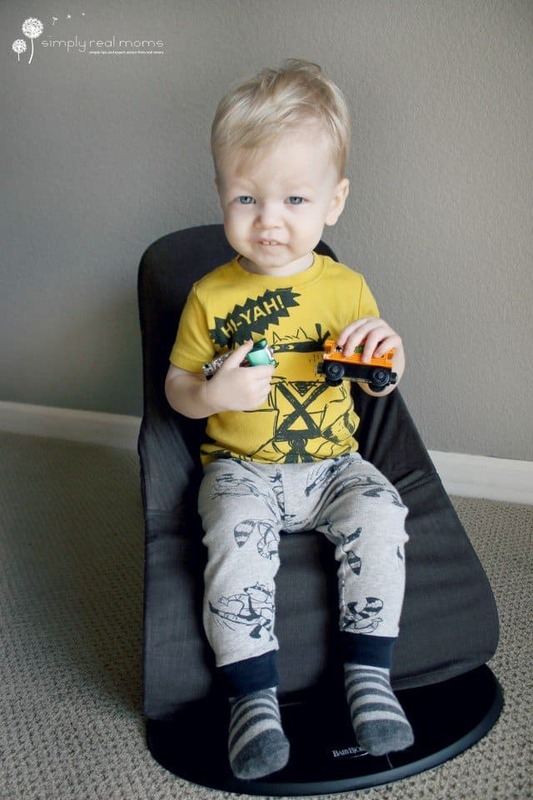 No batteries required for this chair, Baby Charlie loves to kick himself in a fun bouncing pattern! 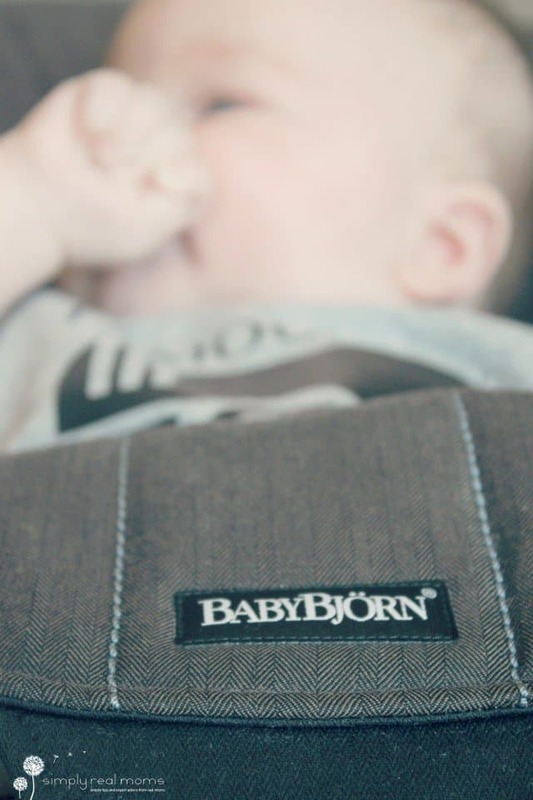 It is ergonomically designed to provide your baby with proper head and back support. 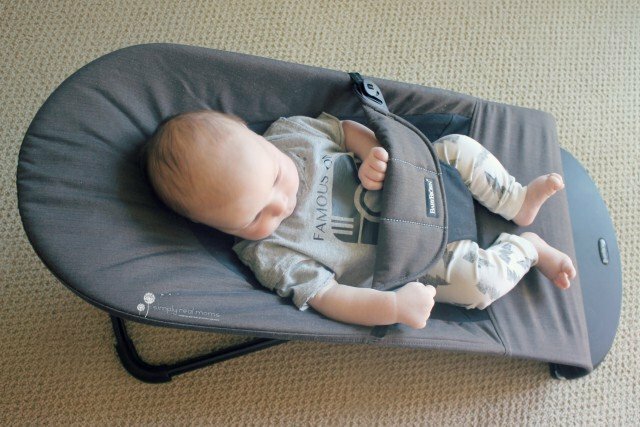 The fitted fabric seat molds itself to your baby’s body and evenly distributes the weight. This gives your baby good support, which is important for young babies whose muscles are not yet fully developed. 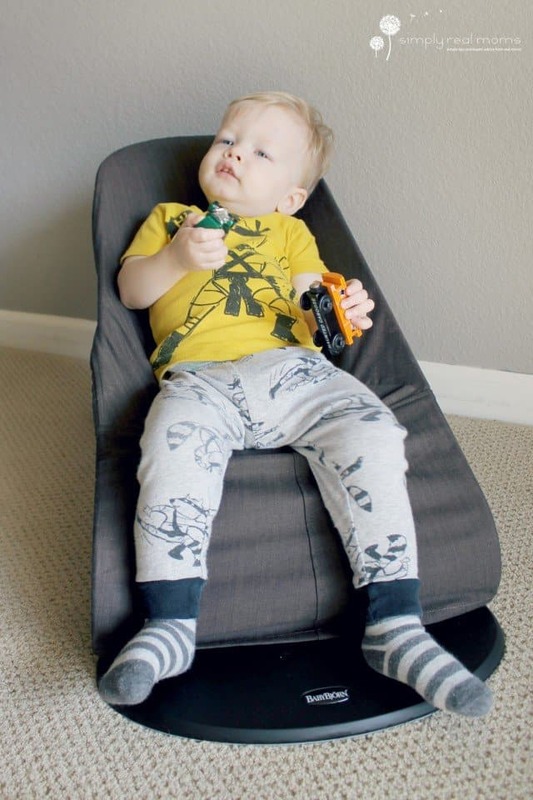 The Bouncer Balance Soft can recline in three different positions, making it easy to sit baby up or lay him down for nap time! 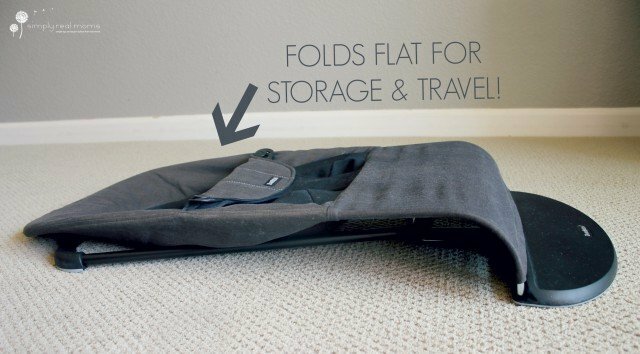 It folds completely flat for easy storage when not in use and also for travel! 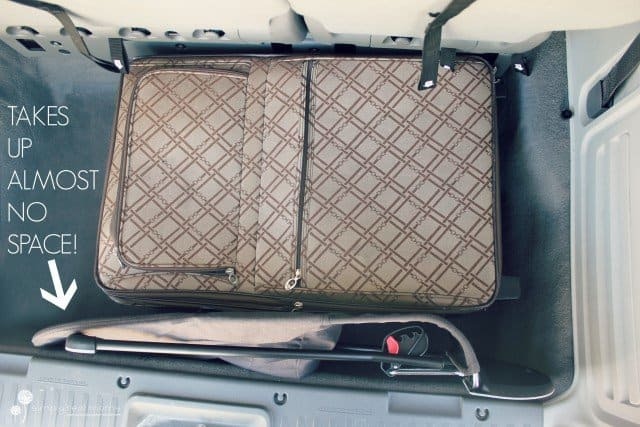 When flat, the Bouncer Balance Soft slips easily in your trunk along with your other gear or travel luggage. Unlike other baby bouncers, this one lasts longer for use because it can be used up till about 2 years old (up to 29lbs)! You simply slip the (machine washable!) cover off of the frame, flip it around and slip it back on for a fun bouncy seat your older child can sit in without the restraint in the way. My 18 month old LOVES to bounce in it and then sit back to relax while we read a story or watch a movie! What a great feature to have a chair that can take your child from newborn to toddler so easily! The Bouncer Balance Soft is a wonderful addition to your baby gear, and one of our new baby must-haves! It’s the bouncer that will grow with your baby and last through all of your kiddos! *We were given product for review purposes, but all opinions are my own. As with all infant seats, you should not use the Bouncer Balance Soft on raised surfaces or leave baby unattended. Anniversary Gifts Can Make You Swoon…or Cringe!